Afghanistan is a landlocked country with Iran to the west, Pakistan to the east and the Hindu Kush mountain range running through its center. It shares a northern border with Turkmenistan, Uzbekistan and Tajikistan with one small border touching China. At 652,000 sq km (251,738.6 sq miles), it is the forty-first largest country in the world. Afghanistan’s climate is mostly arid or semi-arid and the terrain is mostly mountainous. Despite these inhospitable features, 12% of the land is arable, although only 6% is cultivated. Overgrazing, deforestation, soil degradation, desertification, and pollution are current issues threatening Afghanistan’s environment. 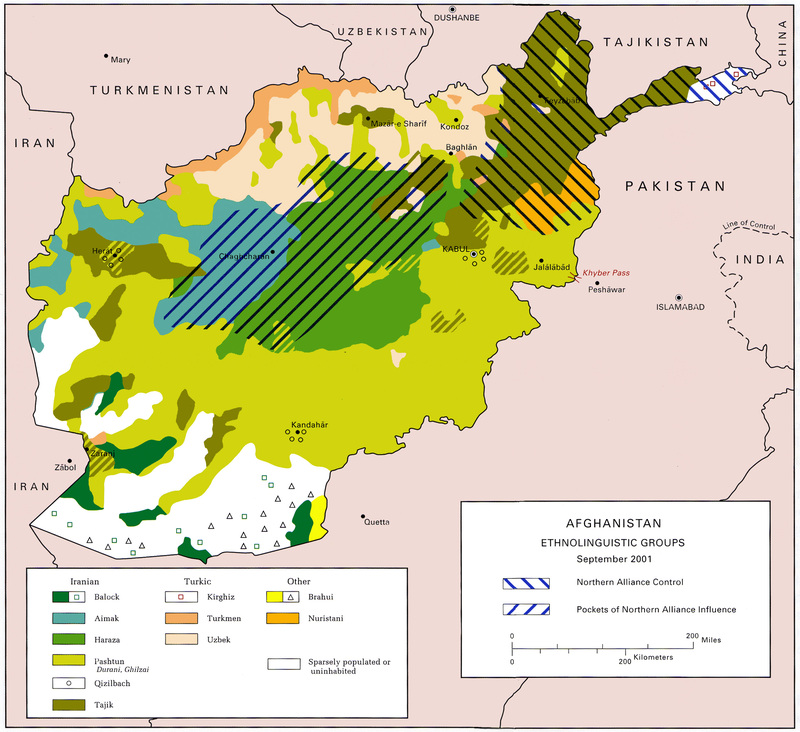 Illegal logging and the scorched earth tactics (destruction of all resources during retreat so there is nothing left for your enemies during wartime) utilized by both the Taliban and the Soviet Union during the Soviet invasion of 1979 cut the amount of forested land from 3% (prior to 1979) to less than 1.5% today. The Afghan government offers little incentive to promote reforestation initiatives and has minimal capacity to control or hinder the highly profitable, although illegal, timber trade. The United Nations Environmental Program estimates that over the past three decades, Afghanistan’s forest cover has decreased by about 50 percent; today, forests cover only about 2 percent of Afghanistan due to war, drought and timber smuggling. In order to combat this the United Nations Development Program (UNDP) is working with the government of Afghanistan and other UN agencies to provide alternative and environmentally sustainable livelihood options to communities, including establishing Village Environment Committees and Green Generation Clubs to educate Afghans about the environment as well as improve the Afghan government’s capacity to deal with these issues. Afghanistan is at the center of many ancient civilizations stretching back at least 3,000 years. Its geographical placement between the Chinese, Indian and European civilizations means that through the centuries it has attracted many outsiders, invaders as well as merchants. Control over Afghanistan has shifted from one foreign actor to another throughout history. Persians, Macedonians, Buddhists, Mongols and Indians have all conquered the area in the past 2,500 years. There is evidence that large numbers of nomadic migrants migrated south from the Caspian Sea to present-day Afghanistan during the late early 2nd millennium. According to legend, as they traveled they sang hymns that were passed on by word of mouth from one generation of priests to another until c. 1200 BCE, when the hymns were added to a collection of volumes known as the Rig Veda. These texts mention a tribe from centuries earlier, emerging from the Hindu Kush and crossing the Kubha, or Kabul, River around 1,500 BCE. Some of the nomadic migrants appear to have settled in Afghanistan. Physical proof of an advanced civilization in northern Afghanistan around 2100-1800 BCE has come from more than a dozen excavations conducted during the 1970s in the region that archaeologists refer to as the Bactria-Margiana Archaeological Complex (BMAC). Findings made at BMAC reveal a series of cities and settlements, each with a distinctive and exceptionally large architectural footprint, with temple structure, administrative quarters and defensive walls. The city in northern Afghanistan named Baktra (present-day Balkh) is recorded in the Avesta as the birthplace of Zarathustra Spitama (Zoroaster), the founder of Zoroastianism, one of the first great world religions that is still practiced to this day. In 559-330 BCE the Achaemenid Dynasty built an empire which at its peak spanned three continents: from Libya, Egypt and Saudi Arabia in the South, to Asia Minor (modern-day Turkey) in the West, to the Balkans and Black Sea in the North, to present-day Afghanistan and Pakistan in the East. In sheer land mass, the Achaemenid Empire was the largest empire the ancient world had ever seen until 331-330 BCE, when Alexander the Great toppled the Persian regime on his eastward march from the Mediterranean through Afghanistan to India. Alexander the Great conquered the region in 300 BCE, and from the early years of the new millennium the Silk Route passed through central Afghanistan carrying commerce, culture and religion between the major western and eastern civilizations. These civilizations have all left their marks on the people and the culture of the country. The Islamic conquest of Afghanistan took place in 652 CE. Ahmad Shah Durrani (1747-1772) was one of the first native Afghans to rule the country, and is widely considered the founder of modern Afghanistan. He conquered all of present-day Afghanistan and by 1761 his Durrani Empire encompassed parts of Iran, India and Pakistan. After Ahmad Shah’s death the Durrani Empire became plagued with civil war and rebellions, and in 1826 Dost Mohammad Khan established the Barakzai Empire. Afghanistan became enmeshed in the “Great Game” during the Barakzai Empire. The “Great Game” was a time when Britain and Russia fought for control over the Middle East. In 1839, Dost Mohammad attempted to form an alliance with Russia after the British turned him away. The British, not wanting Russia to acquire more influence, invaded and conquered Afghanistan. That was the first of three Anglo-Afghan Wars. The second occurred in 1878 after Russia sent an unwanted diplomatic mission. The British wished to do the same, but Sher Ali Khan, Dost Mohammad’s successor, turned away the British envoy at the Afghan border. As a response, the British invaded in early 1879. After conquering the country the British required Afghanistan to house a British representative in all major cities and to grant Britain control of foreign affairs. The final Anglo-Afghan war took place from May to August in 1919. Amanullah Khan, leader of the Barakzai dynasty, saw a way to free his country from the British Empire. He invaded India, but was repelled. To end this war the British and Afghans signed the Treaty of Rawalpindi, which set the border between Afghanistan and India, and granted Afghanistan complete freedom from British control. After independence, Amanullah began to reform and westernize his country. He introduced mandatory education, attempted to force women to stop wearing the burqa (full-length veil), and changed his title from emir to king. Conservative Muslim tribes and religious leaders revolted against these rapid changes, and in 1929, Amanullah fled to British-India. Habibullah Kalakani, a leader in the revolt, became the emir in January of 1929. By October of the same year, relatives of Amanullah had taken back the country and executed Kalakani and his cohorts. Mohammad Nadir Shah, a relative of Amanullah, became king and used propaganda to ensure Amanullah could never return to Afghanistan. Nadir Shah was assassinated in 1933. His son, Mohammad Zahir Shah, succeeded him at the age of 19. Mohammad established regency, allowing his uncles to manage the country, until he felt he could rule effectively. In 1963 Zahir Shah took full control of Afghanistan at the age of 49. In that same year he forced Prime Minister Mohammed Daoud Khan to resign. Khan wanted a unified Pashtun people, and at the time the Pashtuns were spread throughout Afghanistan and the newly formed Pakistan. In 1962 he invaded Pakistan in an attempt to create a Pashtunistan. The Afghan military was thwarted and he was forced to resign. For the next ten years Zahir transformed Afghanistan into a modern democracy. He introduced a new constitution that guaranteed free elections, civil rights, and universal suffrage. In 1973, when Zahir was in Italy for surgery, Daoud staged a coup d’état. In lieu of starting a civil war, Zahir abdicated and did not return to Afghanistan until 2002. Daoud made Afghanistan into a republic and appointed himself president. In 1977, he met with Leonid Brezhnev, head of the Soviet Union, after which he moved to reduce Afghanistan’s relations with the USSR and pivot instead toward the West. Daoud started by signing a cooperative military treaty with Egypt, which was allied with the West, and Egyptian Armed Forces began training the Afghan military and police. In 1978 the murder of a prominent member of the communist People’s Democratic Party of Afghanistan was blamed on the government. Daoud was killed in a coup d’état and the Soviet-backed People’s Democratic Party of Afghanistan (PDPA) took power. The coup was a part of the 1978 Saur Revolution. The PDPA announced Daoud had resigned, and buried the bodies of him and his family in a mass grave. Various groups of mujahedeen, Muslim guerilla forces, rose to combat the newly formed pro-Soviet government, due to its secular nature and reforms that were against traditional practices, such as letting women participate in politics. These attacks caused the new government to request help from the USSR and in 1979, the Soviet Union invaded Afghanistan to support the pro-communist regime. One of the immediate reactions by foreign states to the Soviet invasion of Afghanistan was to fund the mujahedeen. The United States and Saudi Arabia contributed an estimated $40 billion to the rebel groups. It was a costly ten-year war, mainly for civilians in Afghanistan. Between 850,000 and 1.5 million civilians, about 14,500 Soviet troops, and 75-90,000 mujahedeen were killed during Soviet occupation. This war created 5 million refugees and 2 million internally displaced persons. Several factors led to the Soviet withdrawal from Afghanistan in 1989: heavy economic costs, a high casualty count (about 15,000 Soviet troops), and a Soviet regime and foreign policy change (from Brezhnev to Gorbachev). The government the Soviets set up managed to survive until 1992, when the Russian government stopped aiding the regime and the head of the regime was killed by the Taliban in 1996. From 1992-96 Afghanistan was consumed by chaos. There were several factions fighting for power that were supported by governments from different states: Hezb-i Islami supported by Pakistan until late 1994, Hezb-i Wahdat supported by Iran until early 1995, Junbish-i Millil supported by Uzbekistan until mid-1994, the Taliban supported by Pakistan from late 1994, and regional militias. Most violence was seen in the cities, while the countryside remained relatively peaceful. In 1996, the Taliban gained prominence. At first the Taliban were welcomed by Afghans as the group succeeded in instilling a greater sense of law and order, but soon it became apparent that the Taliban sought to impose strict religious law, such as requiring women to wear the burqa, banning television, and jailing men whose beards were too short. Under Taliban rule, the Afghan economy and infrastructure were left in ruins. This was mainly due to the high taxes imposed by the Taliban and their monopoly on trade. The Taliban also allowed the country to become a safe haven and training ground for (U.S. designated terrorist group) al-Qaeda. Al-Qaeda was tasked with the training of Taliban military brigades. Learn more about the Taliban here. 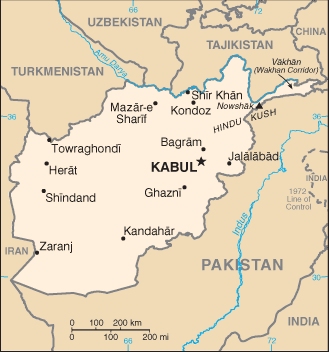 After the 9/11 terrorist attacks, the United States, along with a coalition consisting of the United Kingdom, Germany, Italy, Canada, Georgia, Poland, Romania, Turkey, and Australia, joined forces with the anti-Taliban Northern Alliance with the intention of driving the Taliban from Afghanistan and creating a new government. This coalition pursued al-Qaeda and Osama bin Laden. The coalition forces are still present in the region although the mission has modified its military operations from counterinsurgency tactics (active measures to prevent opposition from native forces) to solely counter-terrorism (focusing on terrorist groups as well as training Afghan security forces), in an effort to make foreign troop withdrawal possible. The number of U.S. troops in Afghanistan peaked in 2010-2011 with about 100,000 troops stationed in the region. In early 2017 that number was down to 8,400. Since the withdrawal of U.S. troops began, the U.S. has taken on an advisory role to the Afghan forces, helping to train national troops, and only engaging in combat if they are under attack. In June 2017, the Trump Administration announced that 4,000 additional American troops would be deployed to Afghanistan to attempt to reclaim increasing Taliban territory but by August no such move had taken place and the president began to “wonder aloud ‘why we’ve been stuck there for 17 years’” because of the country’s trend toward lawlessness and poor governance. Afghanistan’s central government is weak due to underfunding, competition with local factions, a distrustful population and ethnic diversity. This weak governance makes implementing policies aimed at improving living conditions an exercise in futility. Besides the ongoing insurgency, the government is plagued by widespread corruption. In 2015, Transparency International ranked Afghanistan 166/168 on the International Corruptions Perceptions Index. One notable instance of corruption was the Kabul Bank scandal, in which one billion in funds were found to have been “loaned” out to the family and friends of former Afghan president Karzai. To this day, less than $200 million has been recovered. Police corruption is also a huge problem for everyday Afghans. Afghans can expect to face extortion not only from militants groups like the Taliban, but also police and security forces. Bribes, abuse, and collusion with militants are normal behaviors by those meant to uphold the law in Afghanistan. This has manifested itself in widespread discontent with the government, a fact that the Taliban tries to exploit to gain support. The governmental structure of Afghanistan, as set out in its constitution, is an Islamic Republic. The government of Afghanistan is somewhat secular, but is also intended to incorporate elements of Islamic law. Hamid Karzai was elected in 2004 as head of the first democratically elected government since the Taliban was ousted in 2001. Dr. Ashraf Ghani Ahmadzai succeeded Karzai as president in 2014. The president and two vice-presidents are elected every five years and are restricted to two terms. The current vice presidents are Abdul Rashid Dostum (First) and Sarwar Danish (Second), both of whom were elected on the same ticket as Ghani. Abdul Rashid Dostum has been accused of war crimes in Afghanistan and multiple attempts to obtain visas to visit the United States have been denied. Afghanistan’s legislature, called the National Assembly, is comprised of two houses: The House of Elders with 102 seats — 34 elected by district councils for three-year terms, 34 by provincial councils for four-year terms, 34 are appointed by the president for five-year terms — and the House of People with 249 elected seats. There are nine judges on the Supreme Court appointed by the president and confirmed by the House of People. Justices serve for one 10-year, non-renewable, term. Afghanistan still faces issues with Taliban insurgents in some regions of the country, although a democratic government was installed following the U.S.-led intervention in 2001. The continued wars in Afghanistan have led to the displacement of a large portion of its population, many of which have yet to return. Most Afghan refugees currently live in Pakistan and Iran. Pakistan has sent troops to some areas in Afghanistan to secure its border and to control illegal cross-border activities and prevent the crossing of terrorists into their country. There have been some disputes surrounding Pakistan’s encroachments on Afghan territory, but most conflicts have been dealt with diplomatically. Afghan, Coalition, and Pakistani military have periodically met to clarify borders, and since 2014 they have met to discuss collaboration on counterterrorism efforts, particularly against the Taliban. In June 2017, military officials in Pakistan announced that they would be proceeding with a long-stalled plan to build a fence and heighten security measures along the 1,500 mile border with Afghanistan, beginning with the mountainous, semiautonomous tribal regions of Khyber-Paktunkhwa province in the north and gradually extending the work south through the lawless desert badlands of Baluchistan province. There are occasional water disputes over the Helmand River between Afghanistan and Iran. There have been water sharing agreements, but Iran has protested Afghanistan’s restriction of the river flow during periods of drought. The poppy trade is cause for concern for many surrounding countries, not least Russia and former Soviet states such as Uzbekistan. The opiates which stem from the poppy are smuggled from Afghanistan through Central Asia before ending up in Russia. Afghanistan is one of the least developed nations in the world and ranks 169th on the UN Human Development Index. The GDP per capita is $619.8, which places Afghanistan among the bottom 20 countries in the world in terms of real GDP. When adjusted for Purchasing Power Parity (PPP) Afghanistan’s GDP is equivalent to 10% of the world’s average. Afghanistan’s GDP per capita PPP was at a record low in 2002 with $1,088 U.S. dollars, and reached an all-time high in 2012 with $1,899.3 U.S. dollars. The current annual GDP growth rate is -2%. About 36% of the population live below the poverty line. Afghanistan has great potential in mining and other natural resources such as gas, petroleum and coal, but they remain undiscovered due to lack of adequate technology. Instead, the economy is primarily based in agriculture. Production of the opium poppy plant (Papaver somniferum) is significant in Afghanistan because of its high value as a cash crop, though it is illegal to farm. The Taliban taxes poppy production in areas it controls, which is a major source of income for its military activities. Opium, derived from the poppy seed bulb, is used in several drugs, including heroin, , morphine and codeine, which are illegal in many countries, as well as in highly addictive semi-synthetic opioids such as oxycodone . Poppy crops do not provide Afghans with an adequate supply of food, but it is more profitable than traditional food crops. Afghanistan has been the world’s greatest illicit opium producer since 1992, except for 2001 during the U.S. invasion. 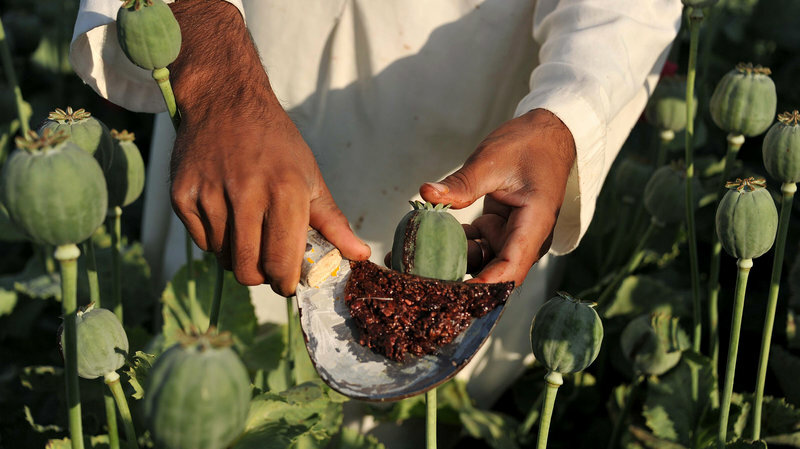 According to one report, Afghan opium continues to flood drug markets, making up 85% of the worldwide market, despite U.S. efforts to curb the production and flow of drugs. Food crops that are grown in Afghanistan include wheat, rye, rice, potatoes, pistachios, almonds, grapes, melons, apricots, cherries, figs, mulberries, and pomegranates. Other agricultural products that contribute to the economy include cotton, tobacco, madder, castor beans, and sugar beets. Sheep farming is also extremely valuable. Afghanistan is the 41st most populous country in the world with a population of 34,169,169 as of June 2017. The annual population increase is around 2.4%. Afghanistan has a large rural population with only 7 million, or 23%, of the population living in urban areas. 77% of the population is involved in farming, herding, or both. The median age in Afghanistan is only 17.8 years old, largely due to the steep population increase, but also as a result of the relatively low life expectancy due to the ongoing conflicts in the country. There are several Afghan ethnic groups. The map below, produced by the U.S. military in 2001 during the war, is dated but can provide general insight into the ethnolinguistic diversity of the country. The Pashtun people make up 42% of the population and are often referred to as “true Afghans,” due in part to their large ethno-linguistic majority, which has historical roots spanning the last 300 years. There are 60 different Pashtun tribes. They are recognizable by the Pashto language and their unique way of life known as Pashtunwali, which is a set of moral guidelines each tribe follows. The Tajiks comprise more than a quarter of the population (27%). Tajiks do not organize themselves into tribes but are instead identified by the different regions where they reside. Tajiks are mainly goat herders and mountain farmers. In addition, there are several small minorities such as the Uzbeks (9%) who primarily reside in the northern regions of Afghanistan and are typically bilingual, speaking Farsi, or Afghan Persian, and Uzbek. The Hazaras (9%) dwell in the mountains of central Afghanistan and have Mongolian ancestry. The Aimak (4%) are Persian-speaking nomads who dwell in western Afghanistan and are largely Sunni. Turkmen (3%) are a nomadic people who are traditionally yak herders. The Balochi (2%) live in the deserts of the Helmand province in Afghanistan and are known to be linguistically talented. They have the ability to speak other ethnic Afghan languages including Balochi, Dari and Pashto. Other ethnic groups make up the last 4%. Due to years of conflict, extreme poverty, lack of transportation, lack of access to adequate medical facilities, and malnourished mothers, Afghanistan has a high infant mortality rate and one of the lowest rates of life expectancy. Afghanistan’s Human Development Index, or HDI, is is 169. The HDI of a nation is calculated by putting together a number of factors, such as education, life expectancy, and gender equality, and nations are ranked by UNDP. 179th in the world is the lowest score, whilst the country ranked 1 has the highest human development. However, some modest improvements have been made. As a result of efforts by UNICEF, USAID, Save the Children, and others, to train midwives and community health workers who can access remote areas of Afghanistan where the need is greatest, there has been a reduction in infant mortality rates. Agencies also invested in and provided basic health care, nutrition, clean water and sanitation to improve the health of mothers and their newborns through new and improved clinics. The infant mortality rate has dropped to 115 deaths per 1000 births (CIA, 2015) from a previous rate of 119.41 deaths per 1,000 births, but Afghanistan still ranks number one in the world in this key indicator. Life expectancy is 61 years (60.5 for men, 62 for women), another significant improvement from the Taliban era. The United States life expectancy rate, in contrast, is 78 years and Japan has one of the highest at 85 years. Afghanistan also has one of the lower literacy rates in the Middle East. 52% of the male population is literate, while the female literacy rate is 24%. There have been upward trends, reflecting an improving educational system, among other factors. Only 50% of boys and about one in twenty girls go to school, and they typically attend only six years of primary school. Of this small group of students, an even smaller percentage goes on to secondary education. This trend is due to a number of factors, including: the high number of rural villages that have limited access to schools, poverty, safety concerns, cultural norms and strict laws that were implemented during the late 1990s and early 2000s (when the Taliban was in power) against educating females, and insufficient numbers of female educators, who are needed to teach girls due to gender segregation. Currently local communities resisting the Taliban are emerging in the rural parts of the country, where there is little government assistance to help ensure security of schools. One way the international community has helped close this large gap in gender education is through the UN’s Afghanistan Girls’ Education Initiative (AGEI), a program whose key objectives are strengthening national and international commitment for girls’ education through lobbying, construction of schools, and increases in security protection for girls’ in school. AGEI accomplishes this by working with the Ministry of Education and providing incentives such as teacher preparation classes, offering scholarships for further education of teachers, and increasing community support for schools as well as female teachers. Female teachers are key to increasing the number of attending female students, as many parents do not allow their girls to be taught by male teachers past grade four. Nearly two decades of constant fighting led many Afghans to leave the cities and find safety in rural areas or flee to the neighboring countries of Pakistan and Iran. Today, there are 2.7 million Afghan refugees still living in exile and 460,000 internally displaced refugees within Afghanistan. The United Nations High Commissioner for Refugees (UNHCR) is currently working on programs to reintegrate internally displaced persons (IDPs) and refugees living outside Afghanistan into Afghan society. The main methods that UNHCR is using include: offering cash grants to returning families; providing counsel in health, legal and social issues; and increasing participation in the program through information sharing with Afghanistan government agencies, such as the Ministry of Refugees and Repatriation (MoRR), and other international humanitarian organizations such as United Nations Assistance Mission in Afghanistan (UNAMA) and United Nations Children’s Fund (UNICEF). Almost all Afghans are Muslims. Sunni Islam has an 80% majority, Shia Islam makes up 19% of the population and less than 1% is Sufi. 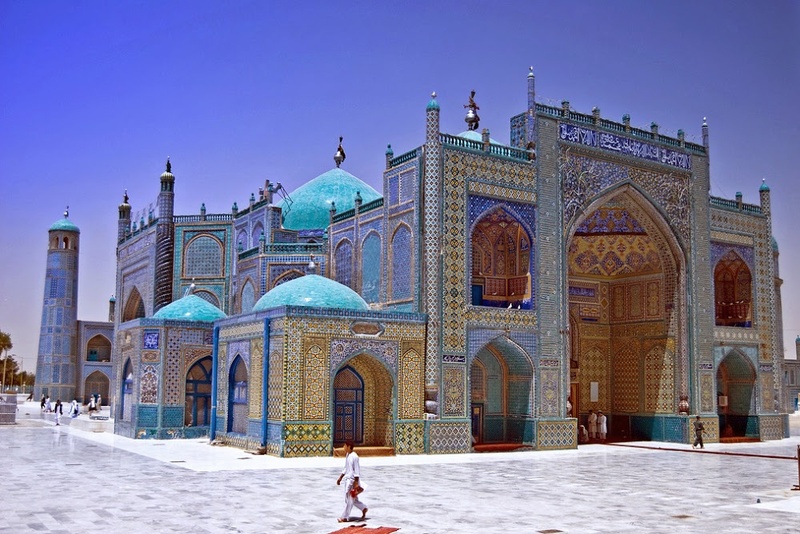 Afghan religious traditions are a combination of traditional Islam, Sufism, and religious folk traditions, known as “folk Islam.” Generally, tribal traditions are more important to Afghans than the scholarly study of Islam. There are two types of Muslim religious leaders, mullah imams and ulama. The mullah imams, or local religious leaders, are usually not formally educated. These imams interpret and extend the religion as it applies to daily life. Many are peasants who do other part-time work. The ulama, however, are trained religious scholars who interpret and uphold Islamic (Sharia) law and scriptural traditions of the Quran in the Fiqh School of jurisprudence, which deals with the observance of rituals, morals and social legislation. The ulama are formally educated in religious schools called madrasahs. When the Taliban came to power they imposed their own interpretation of religious laws on the Afghan people. The Ministry for the Promotion of Virtue and Prevention of Vice enforced prohibitions on behavior the Taliban deemed un-Islamic, for example requiring women to wear the head-to-toe burqa, or chadri; banning music and television; and jailing men whose beards it deemed too short. Afghanistan has a long and rich cultural heritage, due to historical influences of the many ethnic tribes and various empires that have occupied the area. From its critical position on the ancient Silk Road that stretches from Europe to China, Afghanistan absorbed traditions from India, Persia, and Central Asia and blended them into a distinct artistic culture. Afghanistan has endured a history of violence that has shaped, and in some cases hindered, cultural development. Decades of civil unrest that began in the 1970s nearly destroyed this vital heritage. The most recent example of this was the Taliban rule in the late 1990s that imposed strict laws against many cultural pursuits, including music, entertainment, kite flying, and literature. Many of Afghanistan’s artisans were forced to leave their country or give up their craft. The old city of Kabul, once a bustling center of craft and commerce, fell into ruin. The Afghan cuisine is rich and varied, drawing on its diverse population, as well as its extraordinary geographic position, to create a truly distinctive culinary tradition. These foods are primarily composed of its chief crops: wheat, corn, barley, and rice. The cuisine heavily features dairy in its recipes. In addition, Afghanistan is well known for its delicious pomegranates, grapes, and a unique type of Afghan melon. Kabuli Palaw is the national dish of Afghanistan. It consists of rice, carrots, lamb, and raisins. The long-grain rice is boiled in a rich sauce in order to flavor it, then topped with fried carrots, raisins, orange peels, and chopped nuts. The meat is then buried in the rice and baked. Kabuli draws on many of the native crops, like carrots and raisins, and uses meat broth to make up the sauce, fully utilizing the livestock at hand. The hearty dish has become popular throughout the Middle East, and goes by different names and is adapted to suit local tastes, such as roz bukhari in Saudi Arabia. A staple of the Afghan diet is naan. Naan literally means bread (the word having Persian origins), and is a long and thin oval shape similar to pita bread. Naan can be found all across West, Central, and South Asia; you might recognize it from Indian cuisine. There are three other main types of Afghan bread: Lavash, which is often used as plate for stews, Obi Non, a thicker version of Naan, and Chapati, which is a type of round, thin bread. These types of bread are often used in place of cutlery to scoop or grab food during a meal. Afghan dress is as diverse as its people. Often colorful and hand-woven, Afghan clothing is traditionally intricate – the more detail, the higher the price. Gold threads and beads are sometimes sewn into the highest quality clothing, though this is generally reserved for weddings or other special occasions. Clothing for both sexes is typically baggy and loose, a pragmatic design meant to relieve the exceptional heat in Afghanistan and adhere to Islamic standards of modesty. Women’s clothing is usually stitched in complex geometric shapes and is made from light linen due to the hot temperatures of Afghanistan. One of the most common styles of women’s dress is called the Firaq partug, and is composed of three separate articles. The Chador, the first of the components, is a head scarf that covers the hair and extends down to the woman’s torso. This is often richly colored and patterned. The second component, the Firaq, is a garment resembling a dress, though the length of the dress can vary (sometimes ending at the knee, and other times at the ankles). The third component, the Partug, is a baggy garment tied around the waist that extends to the ankles. The Partug is quite similar to other types of South Asian baggy pants, collectively called the Shalwar. The Burqa, now associate world-wide as a symbol of Taliban eraoppression of women, is a full-body covering with a small mesh-window that enables sight. It was mandatory for women to wear a Burqa under Taliban rule, but its presence in the country predates their reign. The Burqa continues to be worn as a cultural and traditional vestige, rather than a legitimately-sanctioned religious one. Men’s clothing is made from light linen and is generally loose, similar to women’s clothing. Men’s clothing did not use to have the bright and complex colors that women’s clothing has traditionally had, although today it has become fashionable to wear clothing with brighter colors and geometric patterns for men as well as women. One typical Afghan outfit is called the Perahan tunban. The two words refer to the top and bottom garment, respectively. The Perahan is wide and long so the material hangs away from the body. Depending on the region, the Perahan can end anywhere from the knees to the feet. The tunban is similarly loose, using a lot of cloth (sometimes several yards worth!) so that it bunches up at the lower leg. Any excess cloth is looped around the waist. Men’s headwear is varied, generally reflecting their ethnic identity and status in Afghan society. One example of prominent headwear is the karakul, which derives its name from the sheep whose wool the hat is made out of. The triangular, conical hat is worn across Afghanistan, and has been for generations. The pakol is a hat that is said to resemble a pita bread when worn, as the top is rounded and the sides roll up to form what takes a similar shape to a pita bread. Music in Afghanistan has been influenced by many different styles. Indian, Persian, Arabic, and Mongol styles have all had a part in the creation of Afghan music. Since the fall of the Taliban, traditional Afghan music has experienced a revival. Klasik (classical Afghan music), Afghan pop and Pashto have all grown in popularity. Some sub-genres of Pashto music include Pashto poetry and traditional folk music which are performed for weddings or funerals. One popular traditional Pashto group is the Kabul Ensemble. The Afghanistan National Institute of Music (ANIM) is helping to revive and preserve both Afghan and Western classical music. It was founded in 2010 and is directed by Ahmad Sarmast. In 2013 ANIM conducted their first U.S. tour which included concerts in two of the world’s most prestigious concert halls: the Carnegie Hall in New York and the Kennedy Center in Washington, D.C.
Abdur Rahman Mohmand was a Pashtun poet from Peshawar in the Mughal Empire. Known as Rahman Baba, he, along with his contemporary Khushal Khan Khattak, is considered one of the most popular poets among the Pashtuns in Pakistan and Afghanistan. His poetry expresses a peaceful mystical side of local culture which is becoming increasingly threatened by less tolerant interpretations of Islam. In 2003 Afghan-born American novelist Khaled Hosseini introduced the world to Afghanistan through his New York Times best-selling novel The Kite Runner. Khaled Hosseini was born in Kabul and captured the tradition of kite racing in the book, as well as life in Afghanistan during the fall of Afghanistan’s monarchy, the Soviet invasion, and rise of the Taliban. Khaled Hosseini is one of Afghanistan’s most successful authors. Cinema, as well as television, was banned under the Taliban. Currently the development of Afghan movies and television is in the infancy stage, but growing quickly. The Afghan Star, a popular television show, is an Afghan version of American Idol. It has had some success, and is currently on its 11th season. One major hurdle to the growth of the entertainment industry is limited access in the non-urban areas, which lack the necessary infrastructure and face pockets of Taliban resistance. A craft specialty in Afghanistan is decorative rug weaving. Although many weavers fled to Pakistan to escape the Soviet Invasion in 1979, and again during the years of civil war and Taliban rule from the 1990s onward, this art is making a comeback as more artists return home. Traditional rugs are made of wool and contain two primary colors: bright red and dark blue. The traditional gul pattern (a repeated octagonal figure) is one of the more prominent and unique Afghan features. The creations of Baluchi War Rugs are a contemporary take on the traditional art form and depict scenes of warfare (i.e. helicopters, machine guns, and missiles) in their designs. Afghanistan shares a history of miniature paintings with Iran, as the Persian Empire once included Afghanistan within its borders. Miniature painting is done on paper, and is generally presented within a book. This presentation allowed more freedom for its artists, as they could choose who would see the book of paintings which freed up the artists and allowed for unusually expressive narratives and pictures. In conjunction with the rise of miniature painting, the practice of illumination flourished in Afghanistan. Typically the painting does not take up an entire page, and so is surrounded by an illuminated border, usually with gold leaf or silver gild. The border is considered equally important to the painting, and is illustrated abstractly, similar to Islamic geometric art one might see in mosques. The paintings themselves were heavily influenced by China, as evidenced by depictions of natural scenes in a traditionally Chinese style. Further, the painting tradition predates Afghanistan’s widespread adoption of Islam. This is why many miniature paintings feature Buddhist imagery. 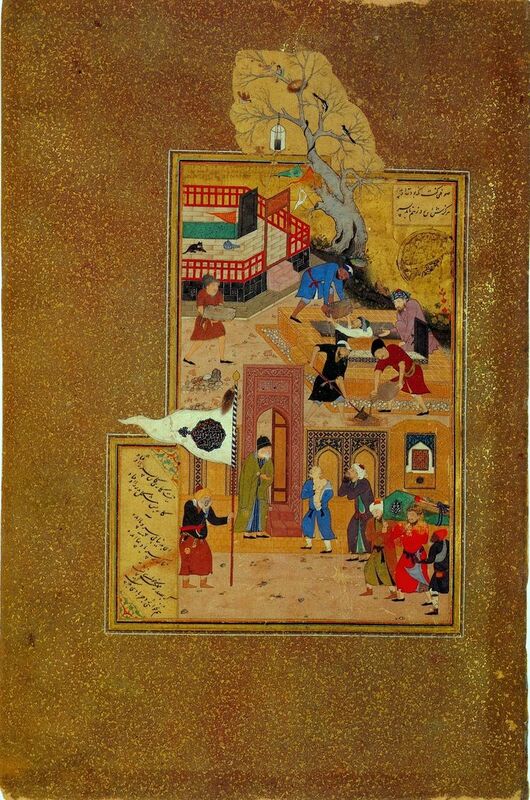 Perhaps the most famous of the miniature painters is Kamal Ud-Din Behzad. Behzad emphasized inorganic structures and architecture in his paintings, using their presence to frame the scene in which his characters would interact. He also would position his characters expertly in order to illustrate a clear narrative. Typical to miniature painting were his use of bright and vibrant colors contrasted with relatively neutral backgrounds. Check out one of his paintings here. Afghanistan also enjoys a long and nuanced history of oral poetry. The most notable form of Afghan poetry is called the landay. Literally meaning “short, poisonous snake” in Pashto, the two-line form was brought to Afghanistan by Iran thousands of years ago and is known for its short length, rigid form, and biting sarcasm. This poetic tradition remains strong today. “Listen, friends, and share my despair. The first poem protests the forced marriage of a daughter to an obviously older man, while the second takes a biting jab at the former occupiers of Afghanistan. Similar to the example, landays often draw on the themes of grief, war, love, politics, nationalism, and love. The suppression of culture under the Taliban, and the prior years of destruction and war that came with the Soviet Invasion of 1979, is exemplified through the trials of the National Museum of Afghanistan, also known as the Kabul Museum. The museum, established in 1922, was renowned for holding the largest collection of art, artifacts and other treasures of ancient Central Asia, Rome, Greece, Egypt, and other parts of Asia. The Taliban bombed the museum in 1993 and this destroyed some of the precious artifacts. Attempts to preserve the museum’s relics by the United Nations were not enough, and most of the museum’s collections were plundered or destroyed. Today the museum is slowly rebuilding. Collections of art, hidden away during the turmoil, are being gathered and brought back to the museum. Within the last 10 years, 16,000 pieces have been recovered with as many as 9,000 of these from outside of Afghanistan. The Taliban also destroyed the world’s largest Buddha statues. Dating back to the 5th century and located in the Bamiyan Valley, these statues, along with many other relics and shrines throughout Afghanistan, were considered un-Islamic by the Taliban and destroyed. The United Nations Educational and Scientific Cultural Organization, with the help from the International Council on Monuments and Sites, is attempting to recover and reassemble the broken pieces of the ancient statues. They have had some success restoring the smaller of the two using a method that incorporates the original pieces with modern materials. The British non-governmental organization Turquoise Mountain, founded in 2006 at the request of HRH The Prince of Wales and the President of Afghanistan, has transformed the Murad Khani district of Old Kabul from slum conditions into a vibrant cultural and economic center. The organization has renovated historic buildings, opened a primary school and a medical clinic, and rebuilt necessary infrastructure. It has founded Afghanistan’s premier institution for vocational training in the arts. Dedicated to teaching a new generation of Afghan artisans in woodwork, calligraphy, ceramics, jewelry design, and other crafts, Turquoise Mountain is reviving the nation’s proud cultural legacy. The Smithsonian Museums of Asian Art in Washington, D.C., is featuring an exhibition based on the Turquoise Mountain initiative. Afghan woodworkers have created magnificent wood arcades, screens, and a pavilion, all carved by hand from Himalayan cedar. Visitors can wander among the arcades and explore spectacular contemporary carpets, jewelry, and calligraphy, all complemented by videos and large-scale photographs of the Afghan artisans who made them. Artisans from Murad Khani bring the exhibition to life by demonstrating their art, sharing their experiences, and allowing visitors to encounter Afghanistan’s art and culture firsthand. Shamsia Hassani: I have changed my images to show the strength of women, the joy of women. In my artwork, there is lots of movement. I want to show that women have returned to Afghan society with a new, stronger shape. It’s not the woman who stays at home. It’s a new woman. A woman who is full of energy, who wants to start again. You can see that in my artwork, I want to change the shape of women. I am painting them larger than life. I want to say that people look at them differently now. Another arts initiative, the Center for Contemporary Art Afghanistan, is a small arts center in Kabul. It offers courses, workshops and a studio space for young artists, mainly women between the ages of 16 and 25. It is equipped simply, with essential materials for visual arts, sculpture, and new media work. The center receives no government subsidy, nor regular funding or endowment from a generous patron, but it is one of the few contemporary art programs in Afghanistan. There are still only two art colleges in Afghanistan, the Faculties of Fine Arts in Kabul and Herat Universities. I am not always able to make or find good opportunities to do graffiti [outside]. Maybe only every two or three months I have an opportunity to do graffiti. Sometimes there are security problems or I cannot go to some area because of the people. I decided to use large digital images, and [then I] can do graffiti inside my studio. I can do graffiti upon these images in my studio using brushes and can paint upon these images. So it’s kind of like a “dreaming graffiti” of mine. It is graffiti but only in my mind. It is not real. Afghanistan boasts many different historical, religious, and cultural features. Many of the country’s architectural treasures have been reduced to rubble by many years of destructive warfare. The ruins, from the famed Bamiyan Buddhas to royal palaces, hold much educational value despite their poor condition. In fact, present-day Kabul is a living microcosm of the country’s still tumultuous narrative. Reconstruction efforts and renewed interest in traditional cultural practices may help preserve at-risk structures. One can also still find vast evidence of former occupiers throughout the country such as the shells of military vehicles and foreign styles of architecture. The most famous site is the Shrine of the Sacred Cloak of the Prophet Muhammad in Kandahar. This ornate and beautifully decorated shrine, adjacent to the local mosque, is the home of what is believed to be the cloak worn by the Islamic Prophet Muhammad — the most sacred religious relic in Afghanistan. The legend of how the cloak came to Kandahar is a popular tale. During his reign in the late 1700s, King Ahmad Shah Durrani travelled to the city of Bokhara, once a major center for Islamic culture, now a modern city in Uzbekistan. There, he asked to “borrow” the cloak of the Prophet Muhammad from its caretakers and bring it back to Kandahar. Suspicious of the King’s intentions, the caretakers forbid him to leave the city of Bokhara with the cloak. To reassure them, the king pointed to a stone in the ground and made a promise. He said, “I will never take the cloak far away from this stone.” Sufficiently at ease, the caretakers lent the cloak. King Ahmed kept his promise. He had the stone removed from the ground and taken to Kandahar along with the cloak, both of which have remained there since. Due to the cloak’s religious significance it is considered a great symbol of power. Rarely seen by the public, it is only shown to leaders of Afghanistan and occasionally brought out to calm the public in times of crisis or after major natural disasters. The last time the cloak was seen in public was in 1996 when Taliban leader Mohammad Omar visited the shrine after gaining control of Kandahar. Being a popular military leader in the region, he was allowed into the shrine with full access to the cloak. A week later, during a public rally, he carried the cloak to the roof of a mosque in central Kandahar and put his wrists into the garment’s sleeves. Mohammad Omar sought to associate himself with the Prophet Muhammad, and as the Taliban mullahs proclaimed him “Commander of the Faithful,” it brought a sense of religious legitimacy to his, and the Taliban’s, right to rule. Located outside the capital city of Kabul, another famous historical site is the ancient fortress of Bala Hissar. The fortress was built in the 5th century AD and has been the historical focal point in many of Afghanistan’s major wars due to its strategic positioning at the end of the Kuh-e-Sherdarwaza Mountain, overlooking the southern end of Kabul. In the 19th century, during the Anglo-Afghan Wars fought against the invading British colonialists, the fortress suffered major damages and was rebuilt in the early 1880s. In 1979, during the Soviet Afghan War, it was the spot of the Bala Hissar uprising, when members of the Afghanistan Liberation Organization (opponents of Afghanistan’s pro-Russian regime) staged riots to overthrow the government. These attempts were suppressed and the members executed by the regime. Recently, in the 1990s, it was the place of many battles fought between warring factions vying for power during the Afghan Civil War and today, is currently controlled by Afghan military forces. Other places of interest include the Band-e-Amir National Park, named the country’s first in 2009; the beautiful Blue Mosque (also referred to as the Shrine of Ali) of Mazar-e-Sharif; and the stunning Panjshir Mountains, located north of Kabul. Taliban suppression of cultural freedom also applied to sports. The popular national sport, Buzkashi (buz-cash-e: translated as goat-grabbing), was also restricted during Taliban rule. Buzkashi is similar to polo in that it is played on horseback, but the objective of the game is to move a headless goat carcass, instead of a ball, to the goal. A single game can last for days. Football (U.S. soccer) and cricket are also popular sports. Cricket first gained popularity in the 1990s among Afghan refugees in Pakistan. When these refugees returned home in 2001, they brought their passion for cricket. That same year, Afghanistan’s cricket team became an affiliate member of the International Cricket Council (ICC). The Afghanistan cricket team has experienced international success by winning the ACC Twenty20 Cup (in 2007, 2009, 2011, and 2013) and the team was the 2010 Asian Games Silver Medalist and winners of the 2012 Asia vs. Caribbean Twenty20 Championships. The Afghanistan national football team was founded in 1922 and has been affiliated with FIFA since 1948. The 1948 Summer Olympics is the only time Afghanistan’s team has made an Olympic appearance. 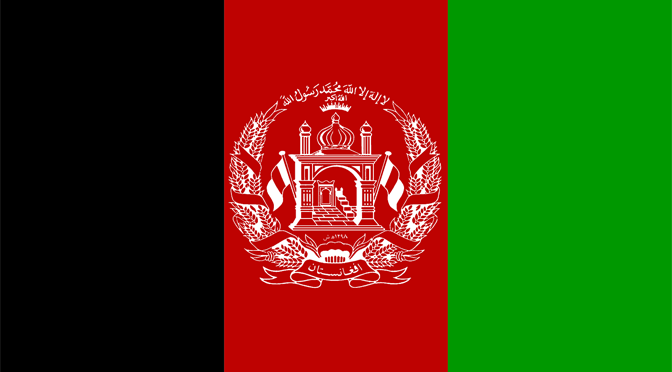 From 1984-2002 they did not play an international match due to the Soviet Invasion of 1979, the Afghan Civil War, and the rise of the Taliban regime, which banned the game. In 2003, Afghanistan’s national football team embarked upon their first ever FIFA qualifying campaign which ended in two losses to Turkmenistan and an unsuccessful bid for the 2008 FIFA World Cup. Afghanistan’s National Football Team achieved its highest FIFA world ranking in April, 2013 climbing to 139th overall. A favorite pastime of Afghan boys that was banned under the Taliban is kite flying. Capturing this tradition in his novel The Kite Runner (2003), Khaled Hosseini writes of his life in Afghanistan during the fall of Afghanistan’s monarchy, the Soviet invasion and rise of the Taliban. His fondest and most tragic memories revolve around kite fighting, an event that included the entire community. Khalid Hosseini is one of Afghanistan’s most successful authors. His novel The Kite Runner was made into a widely acclaimed movie and his 2007 sequel A Thousand Splendid Suns has also seen success. Women have become more involved in sports since the official fall of the Taliban, but continue to face opposition from social conservative elements in society who feel such activity is un-Islamic. Other challenges female athletes face include a lack of financial support and experienced coaches. Efforts to establish women’s soccer and cycling teams have seen minimal success, though Afghan women have medaled in taekwondo. Kamia Yousufi is an Afghan sprinter born in 1996. In 2016 she participated as Afghanistan’s sole female athlete at the Rio de Janeiro Olympics. She finished in 22nd place in the preliminary round, setting a new national record for Afghanistan, but not advancing to round 1. The Council on Foreign Relations covers current events on Afghanistan, considering topics such as drug policy, transnational crime, women’s rights, the Taliban and conflict prevention. 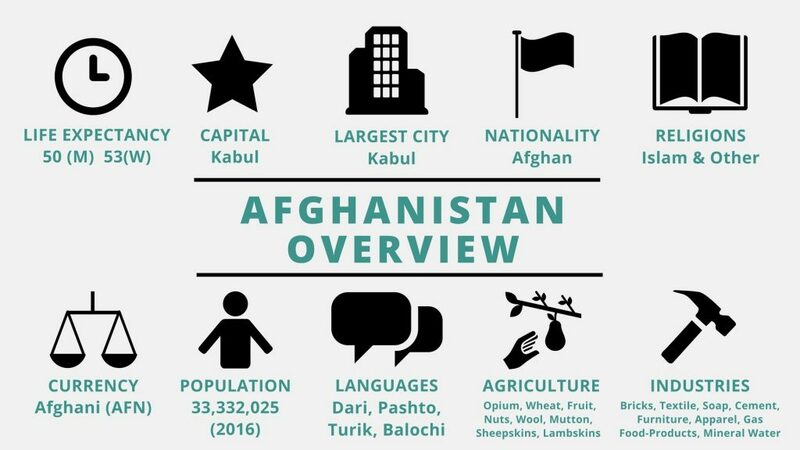 An alternate take on country profiles, this BBC snapshot of Afghanistan provides additional information on geography, history, government and economy. An economic study on Afghanistan including statistics, rankings and resources by Michigan State University’s Broad School of Business. This website offers a wealth of additional information about the nation of Afghanistan, its people and culture.